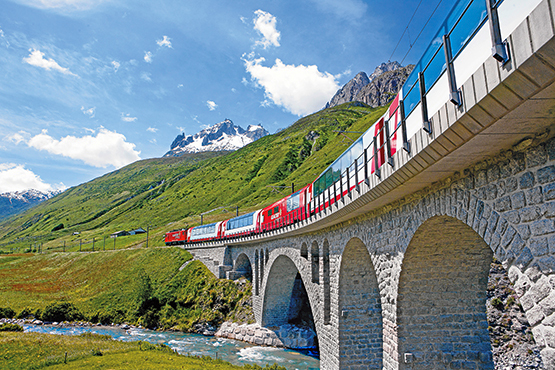 On this remarkable and serene rail adventure with the “slowest express train in the world you’ll find yourself crossing 291 bridges, going through 91 tunnels, up to the 2'033 meters high Oberalppass. Travel in comfort through the unspoilt natural beauty of a landscape rich in ancient, fragrant mountain forests, peaceful Alpine meadows, rushing mountain streams and mountain valleys, soaked in tradition and centuries-old culture. 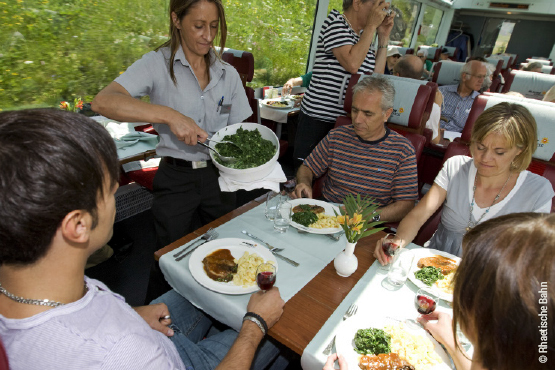 While on your train ride we recommend to preorder the optional lunch, which will be served at your reserved seat. 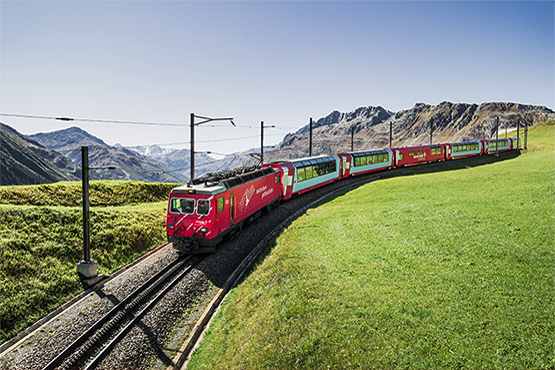 Benefit from our Glacier Express offers and treat yourself to an unforgettable adventure through the Swiss alps. 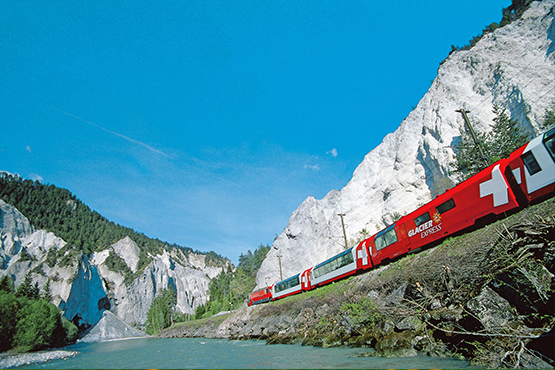 All our packages for the Glacier Express are listed here. At the end of the 30 km long Nikolaital, on the Italian border of the canton of Valais, lies Zermatt, the village at the foot of the Matterhorn, the most photographed mountain in the world. 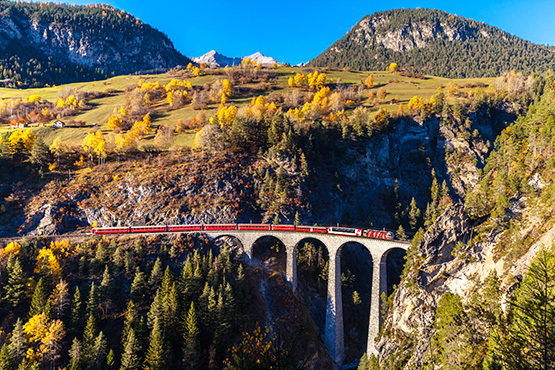 With its 65m high piers tapering upwards, the viaduct is one of the most elegant bridge constructions in Graubünden and the most photographed work of art on the Rhaetian Railway. A must for all railway enthusiasts. 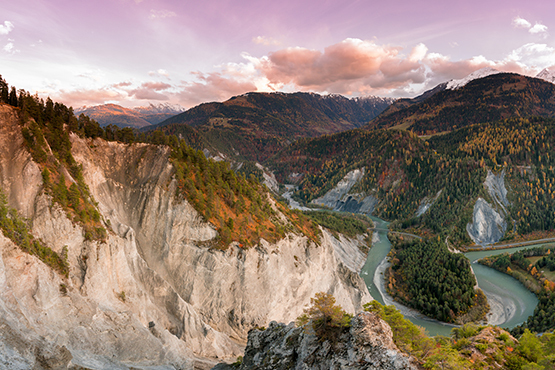 The Ruinaulta or Rhine Gorge is a gorge up to 400 metres deep and around 13 kilometres long in the Vorderrhein between Ilanz and the mouth of the Hinterrhein near Reichenau in the canton of Graubünden in Switzerland. St. Moritz is one of the most famous spa resorts and winter sports resorts in the Alps. Despite only about 5,000 permanent residents, St. Moritz has the character of a cosmopolitan Alpine town. 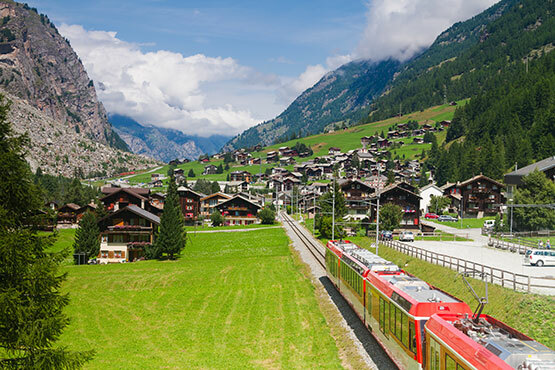 From Zermatt Europe's highest open-air cogwheel railway takes you up to the Gornergrat. The train crosses impressive bridges, galleries and tunnels. 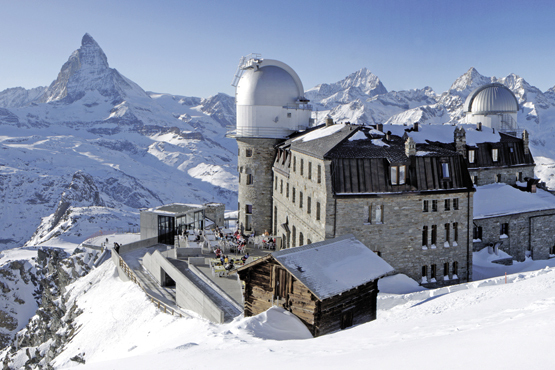 On the summit you will have a superb panoramic view of the Matterhorn, Mont Blanc and other snow-capped peaks rising to above 4000 m. Did you know that the 3100 Kulmhotel Gornergrat is Europe’s highest altitude hotel? 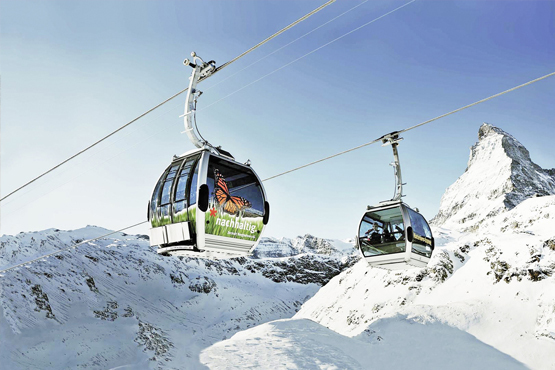 At 3883 m you will find Europe’s highest aerial cableway and summit station. If you want to go higher still, the summit lift will bring you to the viewing platform with a 360º panoramic view that includes 38 Alpine giants. A visit to the world’s highest glacier palace will make the excursion an experience you will never forget. 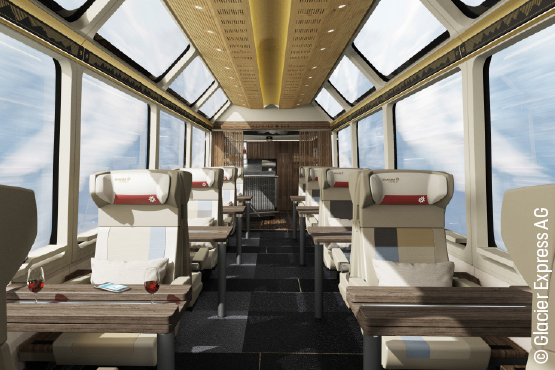 Excellence Class is the new premium coach class of Glacier Express. It impresses with its high-quality full service offer and its modern design. What's included: lounge seating (window seat guaranteed), personal travel guidance, trendy bar area, premium multi-course lunch and more. Enjoy the journey with a cultivated lunch or dinner from the on-board fresh kitchen. 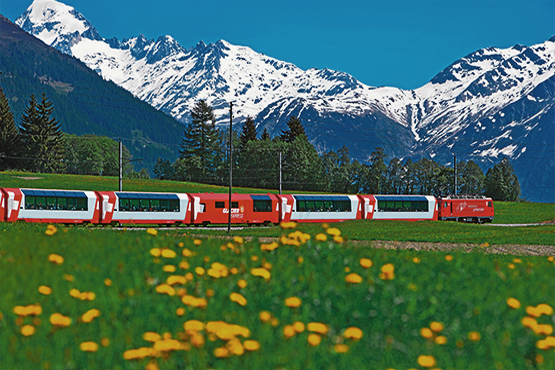 Today you board the Glacier Express which is one of the greatest train journeys in the world. 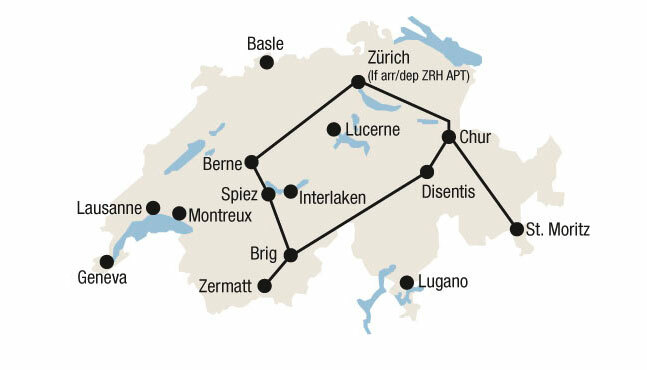 You travel from St.Moritz to Zermatt. An 8 hour railway journey cross 291 bridges, through 91 tunnels and across the Oberalp Pass at 2’033 metres in altitude. 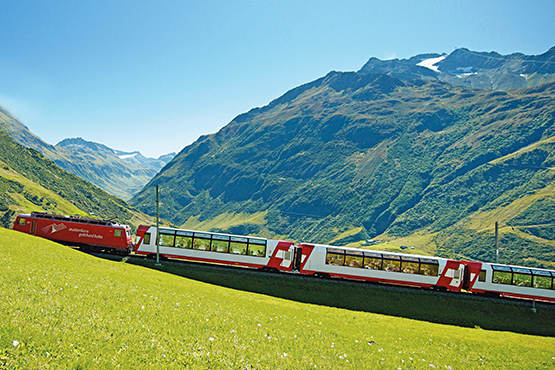 Travel in comfort through the unspoilt natural beauty of a landscape rich in ancient, fragrant mountain forests, peaceful Alpine meadows, rushing mountain streams and mountain valleys, soaked in tradition and centuries-old culture. Optional lunch – if required, please indicate on the booking request. Overnight in Zermatt.